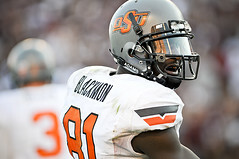 In recent drunk driving news, Justin Blackmon, the first-round draft pick for the Jacksonville Jaguars, was charged with aggravated DUI on Sunday after the Oklahoma state police alleged he was operating a motorized vehicle with a blood alcohol limit or BAC of three times the legal limit, which is 0.08% in all states throughout the U.S. [caption id="" align="alignright" width="240" caption="Justin Blackmon (Photo credit: ShuttrKing|KT)"] [/caption] Blackmon was pulled over by a state trooper at three oclock in the morning and the officer noticed alcohol on his breath. Blackmon was asked to perform a breathalyzer test, which he agreed to take, and blew a 0.24%. Because his blood alcohol level was above 0.15%, under Oklahoma state law he was charged with an aggravated DUI and will face higher drunk driving penalties and fines. Blackmon also was speeding, driving 60 miles per hour in a 35 mile per hour zone, and was driving in the middle of the lane, according to police reports. Blackmon admitted to consuming alcohol prior to driving, and according to reports, his speech was slurred, his eyes were blood shot and he was having difficulty walking at the time of the drunk driving arrest. Police report he was alone in his Chevrolet Tahoe at the time of the arrest. The Jacksonville Jaguars drafted Blackmon in the 2012 National Football League draft as a receiver to improve their offensive performance, which was the worst in the NFL last year. The coach of the Jacksonville Jaguars Mike Mularkey believes that Blackmons confidence that he cannot be stopped or covered will give the Jaguars the kind of edge they need to be successful this season. According to Mularkey, He's one of these guys who doesn't think he can be covered. That's pretty important at that position with that kind of confidence, that you can line up and dare somebody to try to stop you and believe that you can't be. I like that edge." Blackmons record is quite impressive. Last season he had 18 touchdown passes and 111 receptions for 1,782 yards and 20 touchdowns the year before. Dan Edwards, a spokesman for the team did not comment about the DUI arrest and impending charges stating, "We are aware of the report and are gathering information. Todd France, who is Blackmons agent, also has not commented on the receivers Oklahoma DUI arrest. Blackmon must appear in court on Monday at his arraignment, but the Oklahoma police released him on $1,000 bond on Sunday afternoon. Unfortunately, this is the second charge for drunk driving for Blackmon. He was also arrested in 2010 in the state of Texas after speeding down a Dallas highway. This most recent drunk driving arrest will be considered Blackmons second DUI, and he is likely to face severe penalties. He apologized for his early DUI maintaining that it was not who I am. I'm not this guy. I'm humbled by this experience and I will grow from it." The state did not require jail time for his first drunk driving charge. If you have been charged with a DUI and need assistance from a DUI lawyer, fill out the FREE evaluation form to speak to someone about your DUI charges today.